First held in 1906, the Cross Harbour Race has served as one of Hong Kong’s most celebrated events for over 70 years attracting hundreds of participants and thousands of spectators. The event has also attracted significant media attention locally and internationally delivering vibrant photos of athletes diving into Victoria Harbour against the picturesque backdrops of Hong Kong’s mountain and skyscraper views. The Race has always played a major role in advocating the strong Lion Rock Spirit which truly fosters the pride of Hong Kong. The Cross Harbour Race is a physically demanding sports event, requiring both a tactical and technical approach to achieve the best outcome. Racing across the Victoria Harbour, it perfectly blends both natural and metropolitan experience together, and elaborates its extraordinary charm. 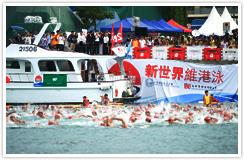 In 2011, the revival of the “New World Harbour Race”, also coupled as one of the celebrations of the 60th anniversary of the HKASA and that of the Hong Kong Sports Federation & Olympic Committee, was a great success with around 1,000 swimmers racing 1.8 km across the Victoria Harbour from Sam Ka Tsuen Public Landing to Quarry Bay Park. 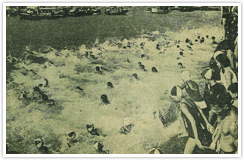 The Race revived an important memory of the Hong Kong community and helped to promote swimming as a sport amongst people of all ages. 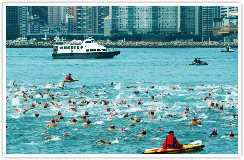 Held in conjunction with the 5th Asian Open Water Swimming Championships in 2012, the New World Harbour Race was recognized as a “M Mark” Event and had attracted over 1,600 contestants including swimming elites all over Asia to swim across theVictoriaHarbourfrom Sam Ka Tsuen Public Landing to Sai Wan Ho Harbour Park. HKASA is confident that the Cross Harbour Race would grow in scale to become an iconic event for Hong Kong and wish all participants and spectators an enjoyable and memorable race this year.